Tourism and hospitality practitioners need to respond to disruptive market changes with innovative digital marketing strategies such as virtual reality, influencer marketing, and techniques that allow for in-depth market research. 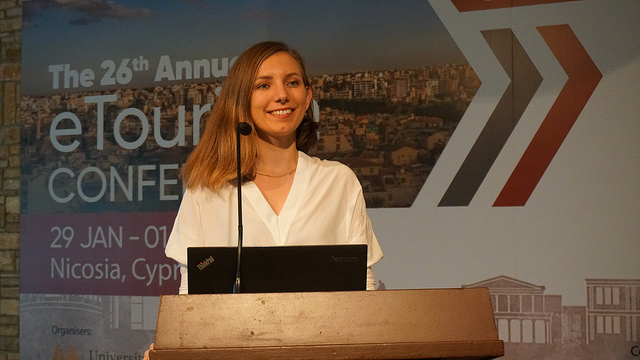 Digital Marketing in Tourism was one of the prominent topics at ENTER2019 eTourism Conference, which took place in Nicosia, Cyprus, on 29 January – 1 February 2019. As the leading independent global community for technologies in travel and tourism, the International Federation for IT and Travel & Tourism (IFITT) organises the annual ENTER conference, bringing together technology experts, travel companies, academics, and local stakeholders to exchange ideas on the latest research and trends for the future of technology and tourism. Daniel Wishnia, Digital Marketing Consultant for GCH Hotel Group, a pioneer in adopting virtual reality for hotel marketing, highlighted the importance of immersing audience guests in 3D experience of their hotels, even before arrival. Apart from virtual reality, Wishnia also stressed the importance of using videos as much as possible throughout web pages to enhance customer service and brand image. “Hospitality companies must keep up with new technologies to continue to appeal to the connected consumers, not only on search engines but also on social media to create a multi-channel presence,” says Wishnia. He asserts that the benefits of developing an appealing hotel’s e-commerce can include maximising revenue generation opportunities and accrual of new customers. Holger Sicking, Head of Market Research with the Austrian National Tourist Office (ANTO), highlighted the rising importance of new data analytics, in addition to classical marketing approaches, for destinations. The research team at ANTO uses internal data sources in combination with several external data sources, such as mobile phone data and user-generated content from the likes of TripAdvisor. Using innovative dashboards and machine learning algorithms, innovative insights are generated and tailored to specific segments. The pretesting of campaigns with the help of emotion analyses, bespoke performance monitoring dashboards, and the use of image recognition in social media further advances their strategic marketing strategies. “Increasingly marketers will become researchers and researchers will become marketers,” says Sicking, indicating that it will be essential for DMOs to participate in data cooperation in the future, with a growing need for experts in these areas. Lisa Binderberger, Founder of Boom Creative Lab, shared her perspective and experiences on “Understanding the full potential of Influencer Marketing”. Her company helps guide clients to embrace the digital age by working with emerging technologies, social platforms and social media influencers to create digital content and promote destinations through their social networks. Binderberger explained that by focusing marketing efforts on opinion leaders, influencer marketing is a cost-effective form of advertisement leveraging direct interaction with consumers based on established trust. IFITT is a non-profit association and world-leading independent global community for the discussion, exchange and development of knowledge about the use and impact of new information and communication technologies (ICT) in the travel and tourism industry and experience. IFITT mission is to share knowledge, experience, and a true passion for ICT in travel and tourism, being relevant for the industry and responsible for society at large, as well as ensuring scientific excellence. IFITT vision is to create THE global eTourism knowledge network and community.